Wash and cut toms in halves or quarters - no smaller! Clear watery juice will have separated from the flesh. 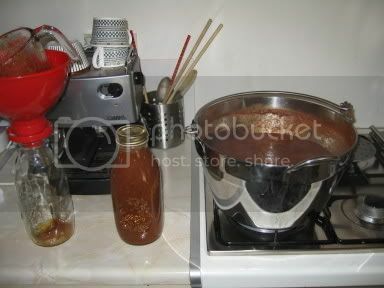 Tip contents of pressure cooker into a seive over the preserving pan. The watery juice will go through, leaving the pulp in the seive. Put the pulp out of the way to cool. Start to boil off the juice. 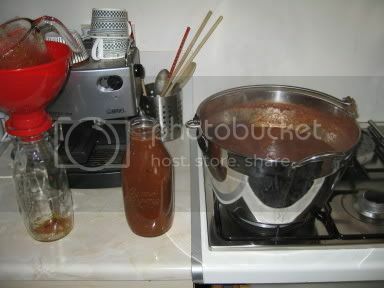 Boil until it is syrupy (reduced to about 1/8 of original volume). This juice-boiling helps reduce the volume quickly, and the clear juice will not stick to the bottom of the pan! Add mush to syrupy juice in pan. 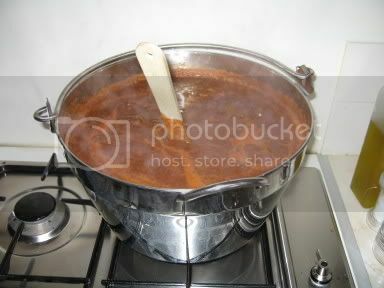 Bring to boil and simmer for ten minutes to a quarter of an hour, making sure it doesn't stick. We think this short simmering of the pulp keeps a fresher taste. The passata will be very thick so a spoon will stand up in it. 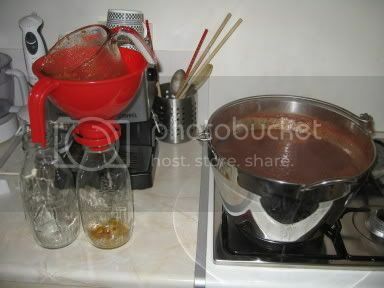 Boil the kettle, put jars in the sink, lids in a bowl, and pour boiling water over everything, including the funnel. Take the passata off the heat until the last bubble blops. Put two bottles at a time on the worktop - one to fill, one to transfer the funnel to whilst the lid goes on. Fill bottle from pan using funnel. 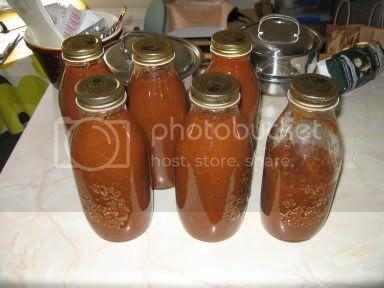 If any tomato gets on the jar mouth, wipe it off immediately - the mouth of the jar must be completely clean. Immediately screw on lid tight. It's not like jam, filling all the jars then topping off - we do them one at a time to make sure the goodies inside stay sterile. There's always some left over (see bottle on right) - this either gets used during the week, or tipped into the next batch and boiled for a few minutes, then bottled again. I don't have a passata machine, nor a pressure cooker anymore, but when you say about mushing the pulp, do you keep everything in, including the seeds? Could I just do it with my little stick blender do you think? As my Kenwood chef's motor has gone, so I can't use my liquidiser. It also de-seeds soft fruit with small seeds e.g. blackberries, rasps, guzgogs etc. Oooohhhh, sprout, I like that machine! Perhaps I can put it on my wish list for Christmas??? I'll have to make do for now though!!! I'm jealous of your pretty sauce bottles, where did you get them, supersprout?? It sounds a bit like a food mill or a moulier (sp?). I bought a food mill at Tchibo for Â£9 a few weeks ago. Worked lovely on blackberries! Now have lovely seedless blackberry cordial to enjoy.